>I have many food thoughts today post yesterday’s Memorial-day cookout. Therefore today will consist of several (maybe 3) individual blog entries about various foods. A mojito is a classic cuban cocktail. If you want to know more about it, or about Ernest Hemingway’s love of it, or about Ernest Hemingway’s polydactyl cats you can check out the Wikipedia entry. There are many different recipes; some use powdered sugar, some include varying amounts of juice, some call for mint schnapps (YECH!! ), some of which I used to follow. Now I follow my nose, but I think of these basic proportions. All mojitos follow the same construction. All mojitos are classy, beautiful through a tall, clear glass, and most (sans schnapps) are light and tasty. 1) Squeeze juice of 1/2 lime into cup and drop the entire lime half into the cup as well. Add mint leaves and simple syrup. 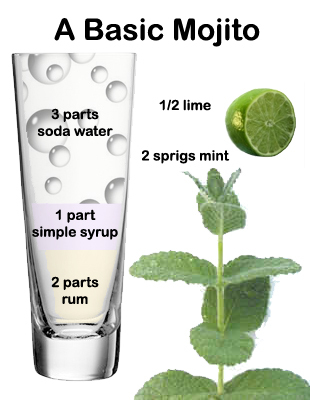 2)Muddle the mint, lime, and simple syrup together. This means that you will take a large blunt object and you will firmly squish all the ingredients together into the bottom of the glass. You can buy a nice muddler, but I use the end of my wooden lemon juicer. Though I have had a nice one on my wishlist for several years (see column at left). 3) Add rum and a scoop of ice. Top with soda water and stir. Okay, that’s nice. Mojitos are nice and I think that the ability to make one should be in everyone’s cooking repetoire. It’s a great host trick, and a great way to impress the ladies. But as usual I can’t leave well enough alone, so I present to you the Mojito Variations. I think the best way to vary a mojito is to add a light flavor to the simple syrup, and I think the best way to do that is to add a flavoring agent to steep while you’re making the simple syrup. But what is Simple Syrup? Simple Syrup is a basic ingredient in many traditional cooking applications. All it contains is sugar dissolved into water, usually on the stove. You can buy this stuff at a liquor store, but please don’t; you’ll only be wasting your money on corn syrup and water. The only important thing to know about simple syrup is that the ratio of sugar to water varies according to your cooking need. Sorbet, for example, typically contains fruit pureed with a 1:1 simple syrup. Cotton candy uses simple syrup in its base, as does marshmallow, as does caramel. For mojitos I typically make a 2:1 simple syrup. So, 2 cups of water to 1 cup of sugar. Simply place the sugar and water in a saucepan and heat over medium heat until the sugar is melted. If you like you can let the mixture boil a little and the color will slightly darken. So for a flavored mojito add some free-floating flavorants to the water while the sugar is dissolving. Allow the syrup to be at a very low simmer for about 10min. Turn of the heat and allow the syrup to cool. When it’s cooled strain out the flavorants and save the syrup in a jar or a bottle. I’ve never had any go bad, or really last that long. My favorite mojito flavor is Lavender. I think it adds a subtle floral note that isn’t necessarily distinguishable from the original recipe but gives the drink a certain something something. But I’ve tried some other flavors, and they were lovely as well. On a side note: an interesting project to do with kids is to make a 1:3 simple syrup (1 cup water, 3 cups sugar) and put it in a sealed mason jar with a piece of string suspended in the middle. You’ll grow rock candy. And now that I write this, I think I should make my own flavored rock candy. Posted on May 27, 2008, in Uncategorized. Bookmark the permalink. Leave a comment.